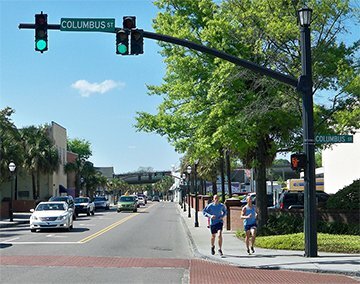 ​Historically, that was US 17-78, and to the right on Columbus was the south beginning of US 701. 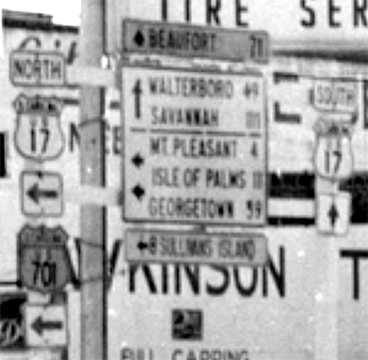 A few years later, in 1935, US 17 was rerouted in South Carolina, generally along its current route. At that time, US 17 traffic turned right here, joining with US 701 all the way up to Georgetown. Also, possibly the US 78 designation was truncated by one block, such that it began straight ahead. And finally, the former route of US 17 was replaced with a southern extension of the US 52 designation. So straight ahead was also the southeast beginning of US 52, meaning three routes probably shared a terminus at that intersection. 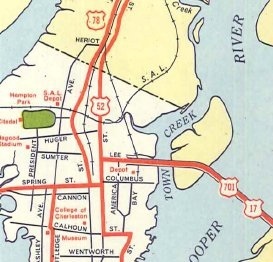 ​That was northbound US 17, which continued to the right on Lee and over the Cooper River. 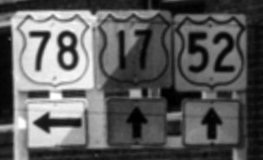 Starting in 1947, that also would have been the beginning of US 701, while straight ahead was the southeast beginning of US 52. 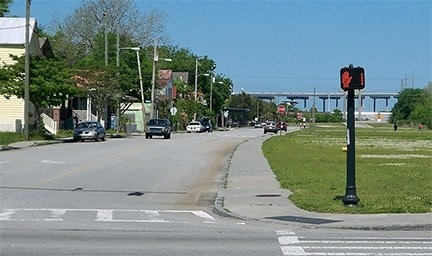 One of the supports for the old Cooper River Bridge still stands at the intersection of Lee and East Bay Street. That was looking east on Line, which carried northbound US 17. US 78 technically went right on King for another block or two, but essentially began to the left. A block ahead was the beginning of US 52, which began by turning left on Meeting. 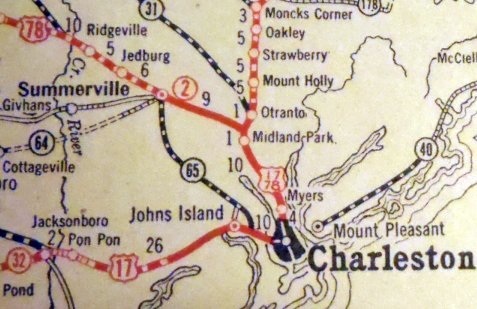 That illustrates how US 17 was changed to tie in more directly with the Cooper River bridges, and how the turns in the old route were eliminated. 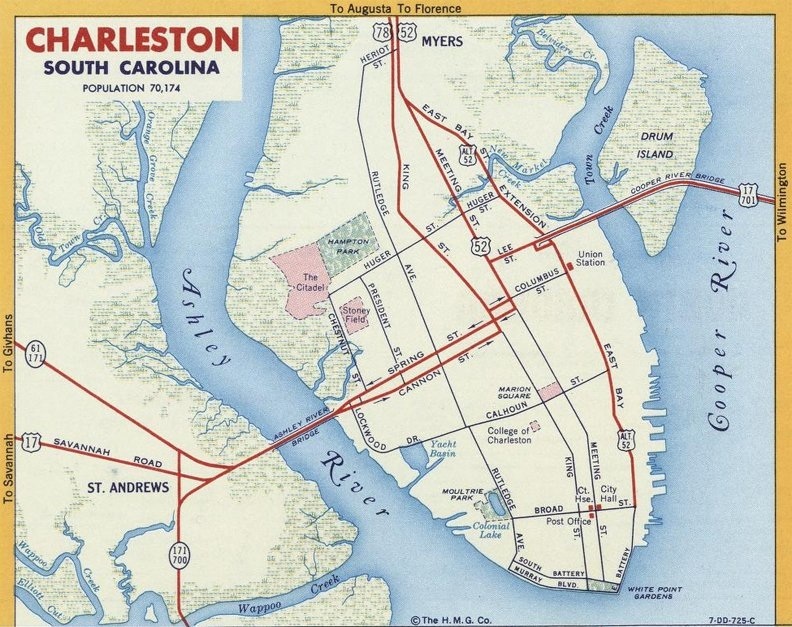 Officially, US 701 continued to end on Lee at Meeting, but probably when the elevated bridge approaches were built, US 701 was no longer signed very well, and this remained the case up until 1992, when its overlap with US 17 between Charleston and Georgetown was eliminated. Also with the US 17 reroute, there was no longer a need for US 78 to go all the way down to Spring, so that designation was truncated a couple blocks, to Line (which was the first surface street south of the US 17 overpasses). The US 52 designation was extended a couple blocks, also ending at Line. 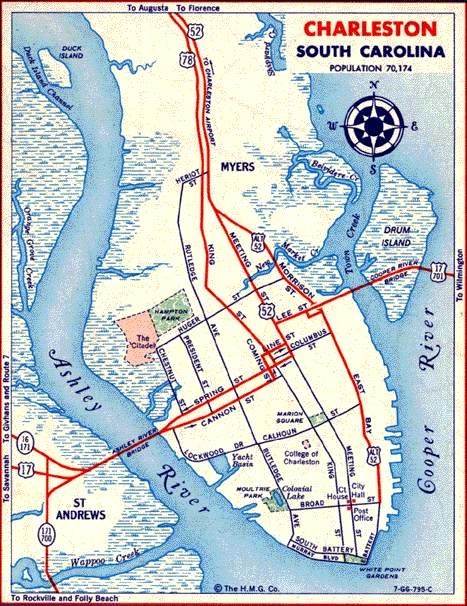 In 2005, US 17 was rerouted to follow the "New Cooper River Bridge" (officially the Ravenel Bridge), but the endpoints of US 52 and US 78 did not change, and they remain the same today. ...even though both routes continue ahead for another five miles. That was looking south on Rivers Avenue, just southeast of the Cosgrove Road intersection. 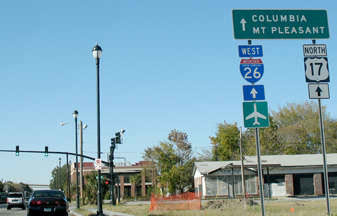 About a half-mile ahead, the two routes split and continue down opposite sides of a railroad (with US 52 on Meeting, and US 78 on King), but there is no directional signage there. About three miles ahead, maps indicate "Spur US 52" splits off Meeting on Morrison Drive (that becomes East Bay Street and goes all the way downtown), but it has not been signed anywhere since at least 1975.
last updated Aug. 13, 2017.